This is the first of a series of articles on background music implemented on PCLinuxOS. We shall start with the Seeburg 1000 Background Music System circa 1959. In 1959, Seeburg Corporation, known for its jukeboxes (the most famous being the one featured in the opening of every episode of Happy Days back in the 1970s), came up with the idea of building a background music system the size of a microwave oven using a stack of records and a tonearm with styluses on both the top and bottom allowing for playback of records on both sides unattended. Theoretically, the system should be able to play 1000 songs without repeating any one selection from a stack of records (hence the name Seeburg 1000). There are videos of this system in action. Just search seeburg 1000 on YouTube. 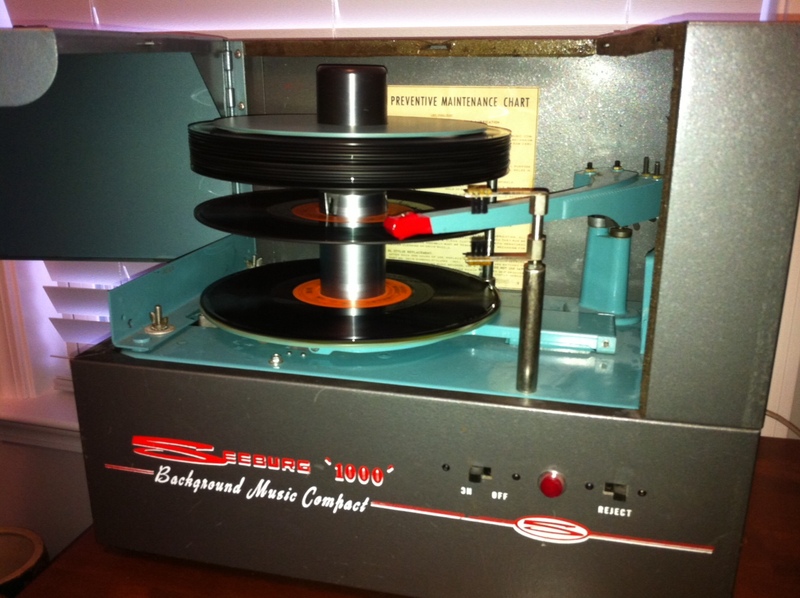 The magic behind the Seeburg 1000 is in the mechanism on how records are played. 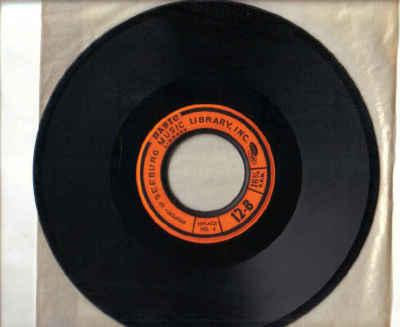 The Seeburg Music Library provides the content for the system in the form of a monthly subscription where a stack of seven records is sent to the customer (with instructions for the customer as the records are carefully ordered as to the sequence where the records are played), with the previous set being returned to Seeburg. The customer opened the front of the Seeburg 1000, and inside is the turntable mechanism consisting of a tonearm, a platter and a spindle, all of special design to make the background music system work unattended. Also included are controls for volume, bass, treble and external microphone, and switches to power the device, as well as to start and stop playback of music. The tonearm has styluses on the top and bottom allowing for playback of the records on both sides without having to flip the record over. The spindle is a two part mechanism with the lower half rotating clockwise and the upper half rotating counter clockwise. The stack of records is placed on the upper half of the spindle allowing for playback of the music starting with the bottom of the stack and the bottom side of the record played first. When that side is finished, the mechanism drops the bottom record halfway down the lower half of the spindle where the top side of the same record is then played. When that side is finished, the record then drops to the platter and the tone arm starts playing the bottom side of the next record in the stack. When all the records have played and dropped on to the platter, the mechanism of the platter then raises the platter until the records have reached the top half of the spindle. Once that has happened, the spindle locks the records in place, the platter is lowered to its original position, and the stack of records is then ready to be played again. The records that go into the Seeburg 1000 are nine inches in diameter with a two inch hole (slightly larger than typical 45 rpm records). The music is recorded at 16-2/3 rpm with a 5mm stylus (as opposed to the standard 7mm stylus found on typical turntables). The records can be played on a standard turntable (there are plenty of YouTube videos demonstrating that), but it is not recommended that one should do so for any length of time as the records will wear out faster with that kind of playback. Records are labelled such that they present the order in which they are to be played in the Seeburg 1000. The Seeburg Music Library is the core component of the background music system and consists of three types of libraries, namely the Basic, Mood and Industrial. 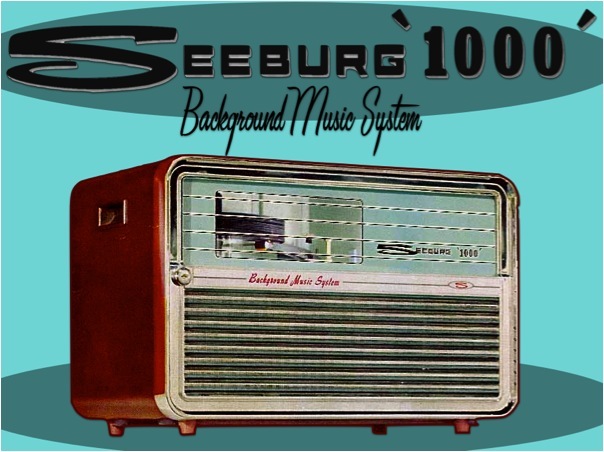 Seeburg Corporation employed their own orchestras for recording of the music, and the music is arranged, sequenced and programmed specifically for Seeburg, and its customers, so what the customer got on the Seeburg 1000 was tailored specifically for that customer's background music needs. Basic: This is the medium tempo music consisting of instrumental covers of show tunes, top 40 (of that day), and standards. This library type was typically heard in shopping malls, department stores, restaurants, and offices. In the late 1970's, this type was renamed Lifestyle to reflect the changing of the times. Mood: This is the medium-slow tempo music designed for upscale venues such as country clubs, high end department stores (such as Neiman Marcus and Tiffany's), and lounges. In the late 1970's, this was renamed Penthouse to reflect the changing customer base for this library. Industrial: Designed to increase productivity, this library consists of medium-fast tempoed music, and was also the most varied as to the types of music programmed for this library. In the late 1970s, this was renamed Upbeat for rather obvious reasons. Among the types of music include polkas, mariachi (with the obvious influence of Herb Alpert and the Tijuana Brass), instrumental disco, blues, and jazz. Some synthesizer music and vocals were included in this library. 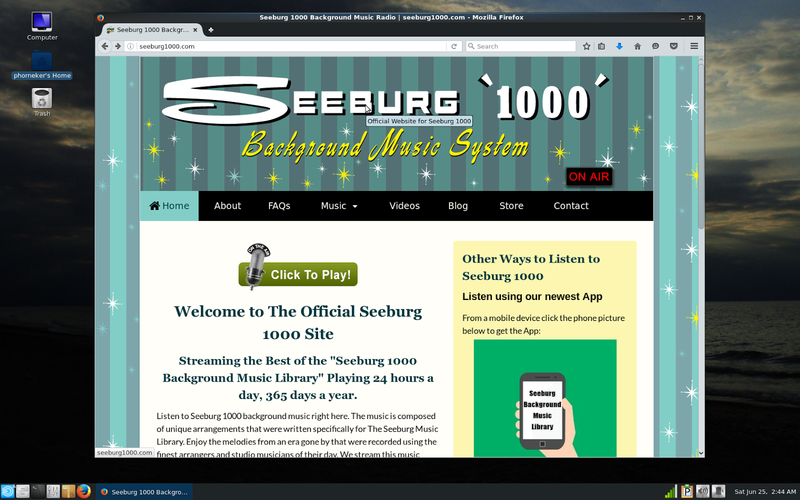 At http://seeburg1000.com, the entire Seeburg Music Library is available for your listening pleasure. You can use Clementine, Amarok, VLC or other media player available in the PCLinuxOS repository to access the library. What we need to do is to download a playlist file containing the URL for the Seeburg Music Library. At this website, click on "Click to Play!" (the button with the microphone on it), and the following will appear on the next web page. There are five logos on this window. The first is the Shoutcast logo. Click on this logo to download the playlist file. The other logos are for iTunes, Windows Media Player, Quicktime and RealPlayer. All of these will download the same playlist file, but only the first logo was intended to be used with any media player. For the MATE version of PCLinuxOS, the playlist.pls file is associated with VLC. The KDE version will associate with Amarok. 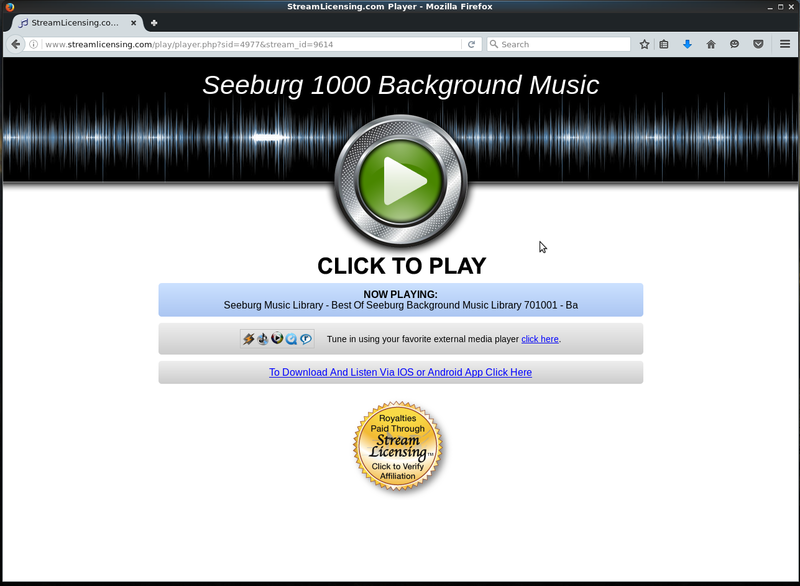 I recommend saving the file to the Downloads directory in your home account as you will want to configure other media players to use the Seeburg Music Library. Select "Save File" and click OK to download the file. 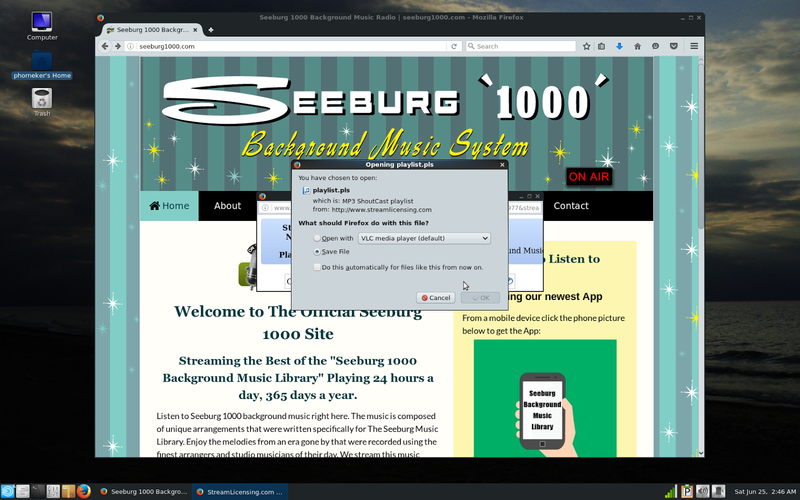 Alternately, if you prefer to use VLC, simply select Open withâ€¦ with VLC selected, and click on OK. VLC will launch and the Seeburg 1000 will start playing. The playlist file is a text file consisting of six lines. Below is the contents of playlist.pls. Much of this should be self explanatory. Here, there is only one entry in this playlist, namely the Seeburg Music Library. File1 contains the URL for the Seeburg Music Library hosted at streamlicensing.com, with the IP address of 50.7.96.210 and using port 8204 for music distribution. Title1 is just what it says, the title of this playlist, namely Seeburg 1000. Length1 has a value of -1 indicating that there is no finite length of the audio track, that is, this is an audio stream rather than a file. In Clementine, go to Playlist -> Add File (or press Control-Shift-A on a keyboard), then select playlist.pls from the Downloads folder and click on OK.
Alternately, you can select Internet on the sidebar, right click on Your Internet Streams, then select Add Stream... from the popup menu. When the dialog box appears, type http://50.7.96.210:8204/ for the URL and Best of Seeburg 1000 for the description and click on OK. The link should appear under Your Internet Streams. Double click on the new link, and the Seeburg 1000 will start playing. This technique will also work with Amarok, Audacious and aTunes, available in the PCLinuxOS repository.